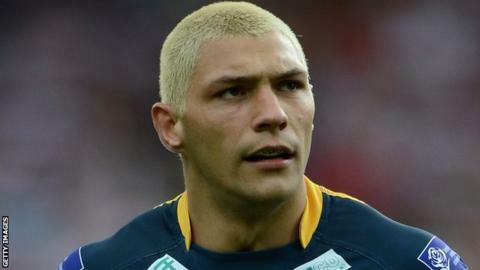 Leeds winger Ryan Hall ran in a hat-trick but ended on the losing side as Wakefield won the West Yorkshire derby. The Rhinos had won their last six matches on the spin but were outplayed by their local rivals. First-half tries from Andy Raleigh, Paul Sykes, who kicked five goals, and Danny Kirmond set them on their way. And, after Hall's second-half hat-trick added to Kallum Watkins' first-half Leeds try, Danny Washbrook, Kyle Wood, Dean Collis and Peter Fox crossed too. When the two teams last met at Headingley on 18 June, Wakefield went into the game as the form side, having won three on the bounce, compared to the Rhinos' run of one win in five matches. But Leeds' narrow 44-40 victory proved a watershed for both sides. It was the first of four straight defeats for Wakefield until last weekend's 35-14 win at Huddersfield, while Leeds had gone on to victory their next five games. But only rarely did Leeds, for whom record-breaking Kevin Sinfield had a rare off night from the tee, threaten to keep that winning run going at the Rapid Solicitors Stadium. After Watkins had responded to Raleigh's early converted try, Richard Agar's impressive Trinity pulled clear to lead 18-4 at the break, thanks to tries from Sykes and Kirmond. That was a great response by Kirmond to a late elbow-led challenge on him by Brent Webb, which left the Wakefield forward on the deck stunned and the Leeds stand-off on report. But Wakefield were then in trouble themselves after the break when Oliver Wilkes was also put on report for a similarly brutal late hit on little Rob Burrow. The scoreboard then also twice blew a fuse in quick succession as far as the home fans were concerned when first winger Fox, then full-back Mathers failed to deal with high bombs from Sinfield, each time Hall gratefully gathering in successfully to score. But Wakefield hit back with two quick tries of their own through Washbrook and Wood. And, although Hall again got on the end of another excellent kick by the artful Sinfield, this time a neat grubber, to bring Leeds back within range, Wakefield stretched clear with tries from Collis and Fox to complete a well-deserved victory. "I think we were creating chances right through the game. "The worry for us was that we let a couple of opportunities slip and we know there is no better team at posting quick back-to-back tries. "Their first try came from an intercept but we didn't go into our shell and for the second successive week defended all right. "The key was that we played to our strengths. One of our goals if we can't make the play-offs was to be a good, competitive team and we've showed that we're a handful for any team when we see enough of the ball." "Wakefield came out of the blocks a lot better. They were gifted field position from some errors from us. "A bit of ill-discipline early gave them that field position which created the tries. "We didn't have our best team out there, but the team that was out there was more than good enough to beat Wakefield had we managed the game a lot better. "Credit to Wakefield, they didn't let that happen." Wakefield: Mathers; Fox, Collis, L Smith, Cockayne; Sykes, T Smith; Amor, Ellis, Raleigh, Mariano, Kirmond, Washbrook. Replacements: Wood, Wilkes, Johnson, Trout. Leeds: Hardaker; Jones-Bishop, Watkins, Ward, Hall; Webb, Sinfield; Leuluai, Burrow, Peacock, Jones-Buchanan, Hauraki, Kirke. Replacements: Lunt, Keinhorst, Moore, Griffin.